All of a sudden a lot of things are emerging. It makes me a little nervous. Today I read about 4 articles concerning the stimulation of the Vagus nerve and its possible use for Fibromyalgia. Am I the only one that gets nervous about this stuff? I just don't like the idea of anything fooling around with my brain until a little more solid research is done. Creating different pathways without knowing all of the effects that it has is just a little unnerving. The Vagus nerve is one of the longest cranial nerves. It's name is derived from the Latin word for wandering. Maybe because it wanders from the brain stem, neck and down to the abdomen. This wonder of a nerve helps regulate our heart beats, controls muscle movements, keeps us breathing and helps keep the digestive tract in working order. Tell me our bodies aren't beautifully and wonderfully made! In this new therapy short bursts of electrical energy hit the brain through the Vagus nerve. It seems that this stimulation inhibits inflammation in our bodies by suppressing cytokine production. Cytokines are released into your system and they help regulate our immune response. In people with Fibromyalgia these pro-inflammatory little babies provide a signal to the central nervous system and create an exaggerated response to pain. Thus, if the Vagus nerve stimulation can inhibit the cytokine production maybe it can reduce the pain of Fibromyalgia and Chronic Fatigue. 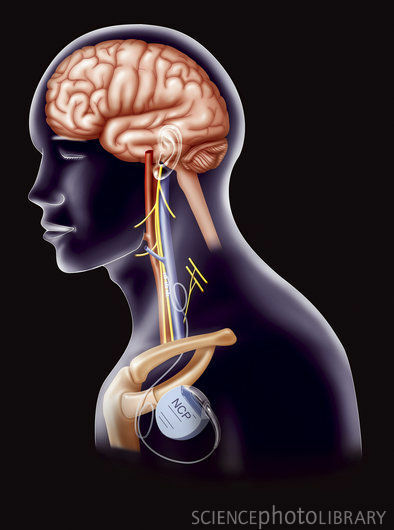 It seems that the side effects of the VNS (vagus nerve stimulation) therapy run the gamut from alteration of your voice, throat pain, headache, feeling out of breath, pins and needles feelings up to nausea and vomiting. Upon further investigation I found out that, GET THIS, meditation can also stimulate the Vagus nerve.! It seems that a state of calm and peacefulness can activate it. So this begs the question, "Is it possible to control this voluntarily?" I almost hate to go there because too many people dismiss us as neurotics anyway but can we get a handle on the pain through meditation? I know that the brain can do amazing and miraculous things and I'd rather try meditation that having something implanted in me to send electrical charges to my brain. OK.......I'm in..........Can I get an "OM?"